I’m sure seeing a lot of Americans expressing their desire to stop paying taxes, now that Trump is going to be the one to spend them. Most of this is just blowing-off-steam, I expect, but some is in earnest. One example is this post from Rachel Murphy Azzara: Tax Resistance Is Our Last Recourse. In related news, Philly War Tax Resistance is presenting at a workshop on Escalating Political Resistance: Tactics for Racial Justice a week from Saturday in Philadelphia. War tax resisters will also be out in force at the inauguration protests in Washington. Erica Weiland at the NWTRCC blog answers one of the most frequently-asked-questions of war tax resisters: Will I go to jail if I refuse to pay war taxes? The (U.S.) National Taxpayer Advocate issued its annual report recently. The report includes a useful appendix summarizing the literature on Behavioral Science Lessons for Taxpayer Compliance. Most of this literature is written from the point of view of learning how to make subjects into more compliant taxpayers, but there are usually good lessons for those of us who are trying to do the opposite. Beware though of the social science replication crisis which may make many of these findings worthless. Nick Stafford paid his car tax by carting five wheelbarrows full of pennies to the Department of Motor Vehicles. James Maule, at the MauledAgain blog, addresses the pay your taxes in pennies technique (and then does it again). 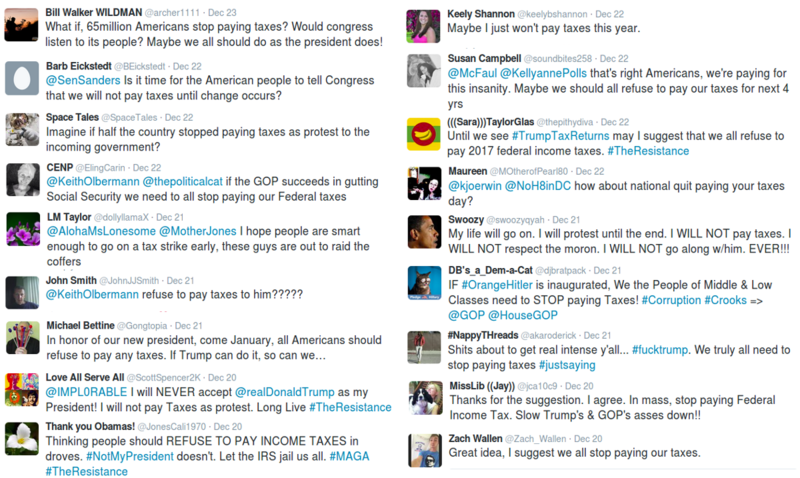 “Pay taxes in an inconvenient or symbolic way” is tactic #70 in the 99 Tactics of Successful Tax Resistance Campaigns . Westfälische Rundschau profiles war tax resister Gertrud Nehls (in German). Mexico is also aflame with tax resistance sentiment, following the gasolinazo in which the process of somewhat privatizing the state-run gasoline monopoly led to a recent hike in gas prices. Here’s an example of coverage from Uruapan.